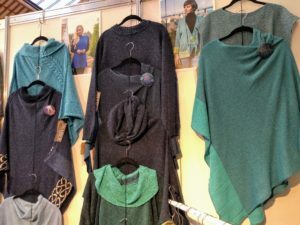 Every year Bill Baber Knitwear launches its new collection at a series of Trade Shows. These are business to business events hosted in a variety of showrooms, exhibitions halls and hotels around the world. In 2019 we will attend Scotland’s Trade Fair in Glasgow, Showcase Ireland in Dublin, MODA in Birmingham and the Celtic Showcase Secaucus in New Jersey. Over the years we have been to Aviemore, Frankfurt, London, Baltimore, Harrogate, Philadelphia, Orange County, Chicago and a host of other locations. At every event we get to meet businesses from all over the world and have developed some great friendships and partnerships many of them into their third decade! At these shows we present a collection of styles handpicked from our range, usually the styles which are the most popular in the workshop, or at least the most distinctive. 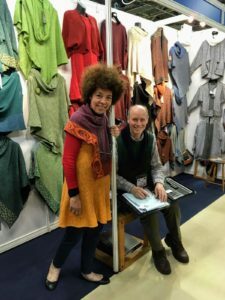 The workshop is a great space for us to learn about our garments as we have thousands of visitors every year and each one gives us superb feedback on everything they try on or buy. We learn about peoples preferences for sleeve length, how they feel about a v neck or roll neck, whether a soft merino is preferable to a lightweight linen, whether you should wear it with trousers or a skirt; a whole host of pointers and lessons learned through thousands of journeys through our collection. It really is fascinating to learn our trade through our customers – even if it’s not always easy to hear! The Argyle. Somewhere between a poncho and a pullover, this style launched in the workshop late in 2018 and has been hugely popular over the autumn and winter. Knitted in a soft merino wool, spun in Donegal Ireland, the Argyle is a melding of Scottish heritage, Irish character yarn & contemporary styling. We offered the Argyle in around 20 colours at the show and, true to form, the assorted greens & blues were popular with the Celtic crowd at both events. There was a focus on earthy tones being available later in the year as businesses prepare for Autumn/Winter 2019 while in the spring we find ourselves knitting them up in coral pinks, pastel shades and light naturals. In fact, we have a few design tweaks working their way through as we speak. Based on the Argyle shape we have a Fairisle inspired garment which draws on patterns from our collections in the 80’s and 90’s. An exciting rebirth of pattern work we haven’t explored for over 20 years. We are also planning some long sleeved variants. The Ballater. A classic shape in the collection, this diamond shaped poncho features one of our newer knot motifs, this one designed by Becky while she was interning with us a few summers ago. The Ballater comes in around 20 colours and has been well established in the range for over a year now and continues to find fans everywhere. The Jura Shawl. A simple woollen shawl with a neat cable design down one edge. The Jura Shawl with it’s cowl neck has been really popular in the cooler weather. It’s a little unusual in our range, similar to the Argyle in this respect, in that it’s a single colour garment. There are no celtic knots picked out in contrasting or complimentary colours, no reverse areas showing off background tones and no stripes, shapes or motifs. Just classic and elegant. This year we also launched a selection of new colours and you can see some of the details of this process in Jack’s colourway blog. The new colours are an expression of where we are in the year or what sort of a mood we are in as a creative business. Sometimes they reflect a fashion or a trend or quite often they are the realisation of something that we have seen in nature that bubbles to the surface while we are seeking inspiration. Sleet. This seems perfect for the weather outside as it is an icy cold, rainy blue and grey. Works with denim colours and feels very contemporary. Mustard. The colour of the season so far. Has hints of cinnamon and burnt sienna a real rich warmth in the texture. Grape. A deep purple richness, picked out in highlight of lilacs, light purples and burgundy tones. A complex luxurious colourway. Biscotti. Based on our popular Oat colour. Biscotti introduces more chocolatey, burnt biscuit hues and is a great counter point to the lightness of the oat and ecru tones that are popular through the spring. Cavan. A lime green and grey combination. A lovely spring tone that picks out the details in a dark turquoise, the colour of the last 18 months, making cavan an easy tie in to your wardrobe. We have lots of other colours being launched and plan to release them on our facebook page and online through the year. Why not join our newsletter so you don’t miss out on any of our new knitwear? You’ll be seeing us at MODA in Birmingham next. It’s a show we have visited, but never exhibited at. Wish us luck! This event focuses more on the fashion elements in our range. It’s an opportunity for us to wield our bold linens, geometric designs and to unlock some of the styles from our range that we don’t share too often online. We look forward to sharing some of the outfits and colours that we have on display and are really excited to meet so many new businesses. We will let you know if we bump into any new designers and collections that we think you should be looking out for! After that we are on to Secaucus New Jersey for our 22nd or 23rd appearance at this annual event. It’s an unusual one in our calendar these years as it takes place over three floors of a hotel. Each business has its own suite with a large double window looking out into the airy atrium. We love this show as there are so many old friends all around and at the end of the day we can collapse straight onto the sofa! Maybe after a quick visit to the bar! Thanks for reading everyone and do let us know what you think of our new colours and garments!